Identification of wetland restoration and creation opportunities. Evaluation of restoration plan, design preparation, and banking application. Monitoring and oversight of restored plant community maintenance activities. 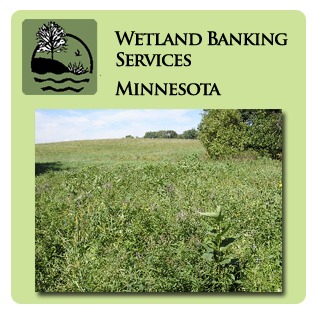 Kjolhaug Environmental Services Company, Inc. (KES) has been involved in a number of wetland banking projects throughout Minnesota. Our role in the banking process has been from start to finish, and often continues after approval. A few examples are provided below. The Blue Flag Wetland Bank project, located in Sibley County, resulted in over 170 acres of restored wetlands and upland buffer that had been previously drained and in crop production. Approximately 35 acres of restored wetland and 4.8 acres of upland buffer were deposited into the state wetland bank, with the remaining 26.8 acres of restored wetland and 83 acres of buffer put under a RIM easement. KES assisted with the plan design and banking application. The Fairview Farms project, a residential development project in Washington County, resulted in approximately 36 acres of new wetland and 38 acres of upland buffer establishment. Wetlands were created through shallow excavation in areas of mapped hydric soils and a high water table. KES collaborated on the grading design, gained approval of the banking application, coordinated vegetation activities, conducted wetland monitoring, and processed the deposit of credits into the wetland bank. Wild Meadows was a 345-acre conservation development in which 200 acres of forests, prairies, and wetlands were restored or preserved, and put under a permanent conservation easement to be held by the Minnesota Land Trust. The innovative plan integrated restored natural habitats with storm water treatment in a “treatment train” concept that was unfamiliar to most of the regulatory agency staff. KES prepared the banking application, provided monitoring services, and ultimately deposited over 13 acres of wetland credit and over 13 acres of upland buffer credit into the wetland bank.